Mowing the lawn is a pain. An unkempt yard is a hazard. Solution: Bring in the sheep. On a four-acre patch of unused industrial land along Cleveland's Lake Erie shore, a flock of 36 sheep (plus one protective llama) is being employed to keep the grass short. Chomping away in the fenced-off space all summer long, the sheep kept the lot looking tidy for half the cost of a landscaping crew -- $1,500 compared to nearly $4,000. 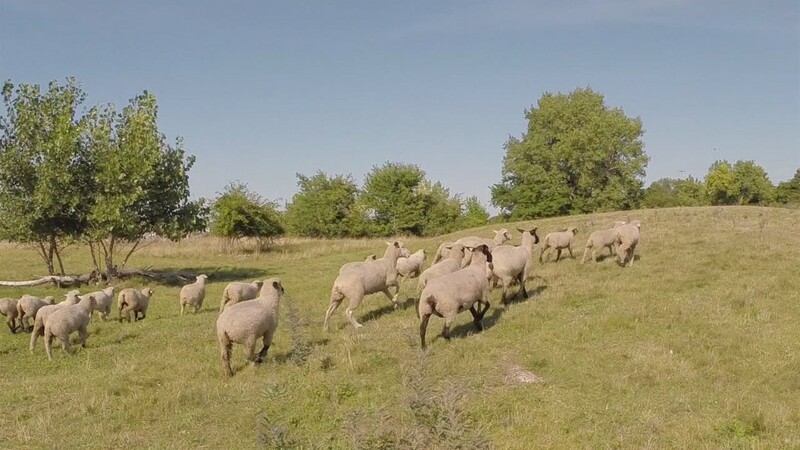 "There's a lot of empty land, and not a lot of money to take care of it," said Michael Fleming, executive director of community development organization St. Clair Superior, which founded the sheep grazing program in 2012 with $8,000 in grant money. The program is part of a broader city effort launched in 2009 that seeks to green a specific sector each year until 2019, including energy, transport and open space. The idea is to not only be more environmentally friendly but to eliminate wasteful spending that can then be directed toward job creation and making the city more livable, said Jenita McGowan, the city's chief of sustainability. In 2012, the focus was on food, and many of the programs are still going strong. Improving access to healthy food is especially important in Cleveland, where many neighborhoods have heart disease death rates twice that of the suburbs. Overall life expectancy is shorter as well. "There are major health disparities that exist in low-income neighborhoods," said Tim Tramble, executive director of Burten, Bell, Carr, a community development organization in the city. "If all you have is Burger King and McDonald's, and no vehicle or supermarket, all you'll eat is Burger King and McDonald's." 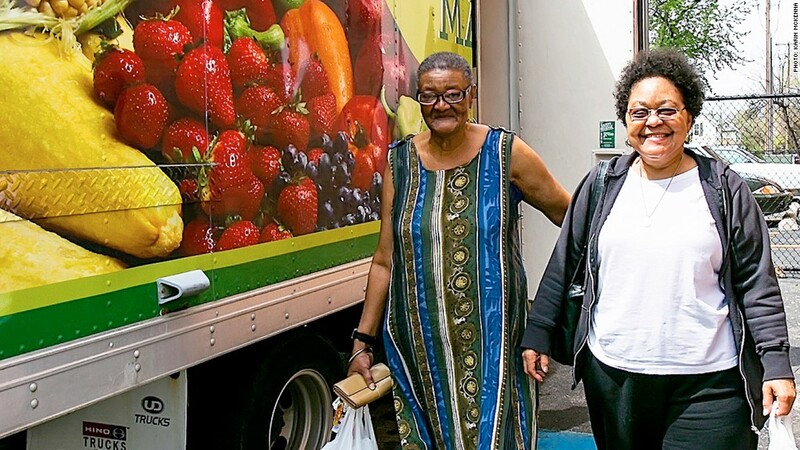 For the past year, Burten, Bell, Carr has been running a mobile farmers' market in some of the city's poorer neighborhoods. Each day, a truck full of fruits, vegetables and fresh bread makes the rounds to various community centers and housing developments. The truck sells food for about a 20% markup -- similar to supermarket rates. Last year, the program cost about $10,000 more than it brought in, said Tramble. This year, he hopes it will make a small profit. Cleveland residents picking up veggies from Burton, Bell, Carr's mobile food market. There's also a community kitchen were folks can learn healthy ways to cook what they buy off the truck. Other programs in Cleveland include city funding for greenhouses so local farmers can extend their growing season, classes on urban agriculture from Ohio State University Extension, and an incentive that gives extra money to food stamp recipients if they shop at farmers' markets. Access to good food isn't just a quality of life issue. Poor nutrition is linked to everything from low self-esteem to disease and poor educational performance. It's literally costing the nation billions in health care costs. McGowan said it's too early to tell if the food programs are paying off in terms of health, though people who frequent Burten, Bell, Carr's cooking class sure seem to enjoy it. As for the sheep, Fleming is thinking of new ways he can make money off them and expand the program. He gets some money from the landowner, who would otherwise have to pay someone to mow the property. Selling the wool and lanolin -- a wax used in skin care products -- is another possibility, as is the rather creative idea of putting advertising on jackets worn by the flock. So are lamb chops -- he said several local restaurants are interested in putting the sheep on the menu.